In 2017, the United States spent around 609.76 billion U.S. dollars on its military. 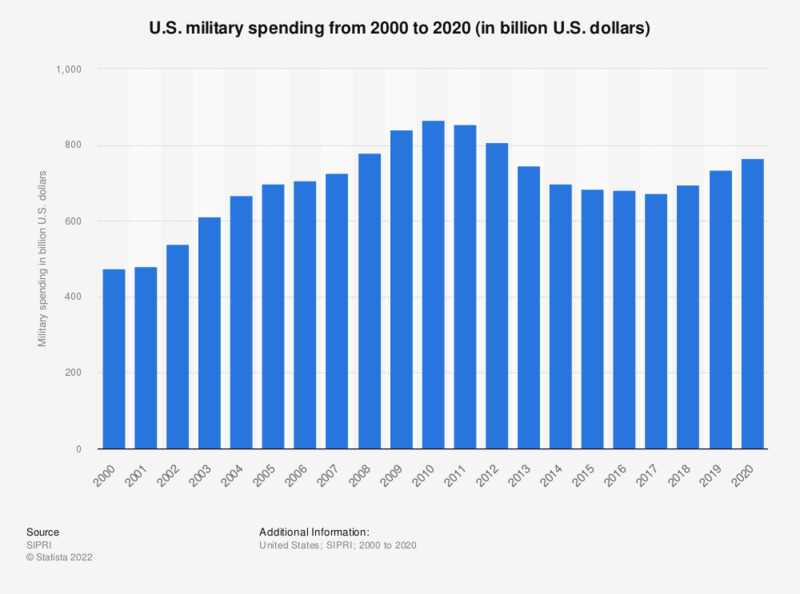 This figure is a decrease from 2011, when U.S. military spending amounted to 711.34 billion U.S. dollars. Military spending in the United States is the part of the national budget for the Department of Defense. This budget is designated for the four branches of the United States military, and is used for everything from salaries, trainings, development of new military technologies, and new aircraft and weaponry. The United States is well known for spending more on its military than any other country. In 2018, it was estimated that the per capita defense spending amounted to 1,989 U.S. dollars. While this figure is extremely high, many Americans may find it worthwhile, as a majority believe the United States to be the number one military power in the world. The information refers to the value of the dollar by 2011. All figures refer to the fiscal year (October 1 last year to 30 September of the year indicated). Values were rounded to a better understanding of the statistic. Asia: How concerned are you that China's territorial disputes with its neighbors could escalate to a military conflict?